This evening we are back to black tea, English Breakfast Tea. 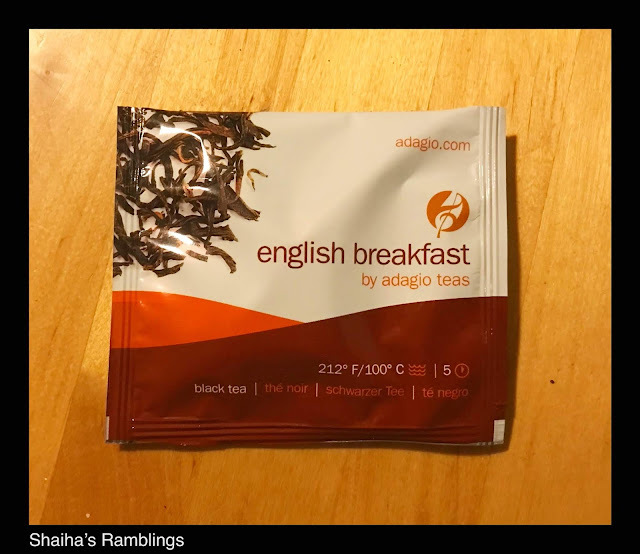 This style tea actually has a lot of memories for me as it was the beginning of my tea journey and one of the only teas I drank for years.This is a tea that usually requires a bit of cream and sugar to make palatable as it can be quite astringent. In fact, it is designed to be enjoyed in this fashion. I find Adagio's version of this style quite delightful. The taste is bold yet lacks a lot of the customary bitterness so it actually can be enjoyed no matter which additives you prefer even if it is a total lack of them. For a tea 'bag', this is one of the better ones and one that I think will make it into my cabinet especially in the winter so that I can be assured a decent cuppa tea no matter where I go.